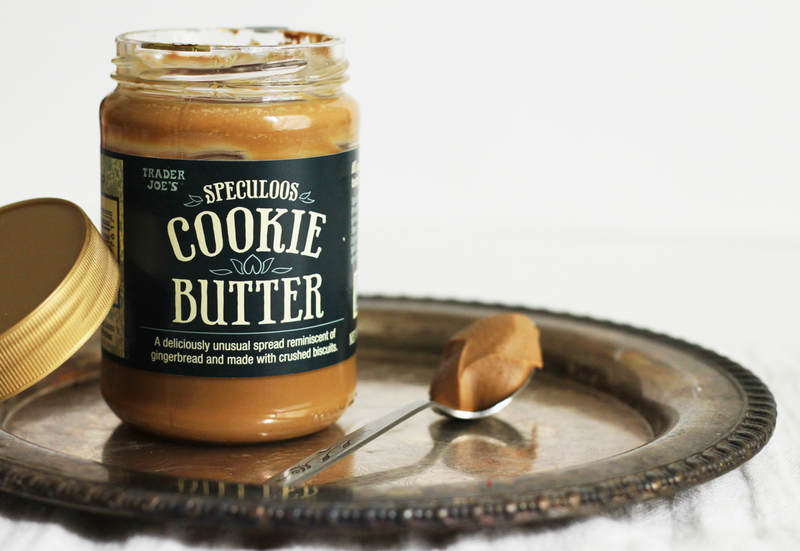 Everyone, this is Cookie Butter. Cookie Butter, these are my friends. Cookie Butter's new in my neck of the woods, so let's give him/her a warm welcome, shall we? There's a Trader Joe's near my parents' house in Northern Virginia, but definitely not one in the Shenandoah Valley. I try to go whenever I'm home; it's generally a good idea for me to have adult supervision. I really can't be trusted to control myself in there. 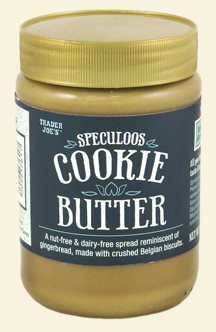 In case you're unfamiliar with Cookie Butter, it's a spread with a consistency like peanut butter, but it tastes a little like gingerbread. It's made with crushed Belgian biscuits, and it's ridiculous. Ever since I read about it on Averie Cooks, I haven't been able to get it out of my mind. So I finally bought it over Christmas Break. When I brought it back to my apartment, my roommate Brandon and I tried it. *minds blown* Then we tried it with Nutella and Marshmallow fluff. Oh.my.goodness. 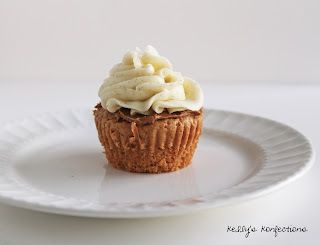 Cookie Butter Cupcakes stuffed with Nutella topped with Marshmallow Buttercream Frosting. 2013 New Years Resolutions, be damned! You HAVE to make these cupcakes SOON! And serve them with a glass of milk. Seriously, guys. This may be the greatest thing I've ever made. Second Note: I would recommend having a full jar each of Cookie Butter, Marshmallow Fluff (7 oz) and Nutella, just to be on the safe side. 1. 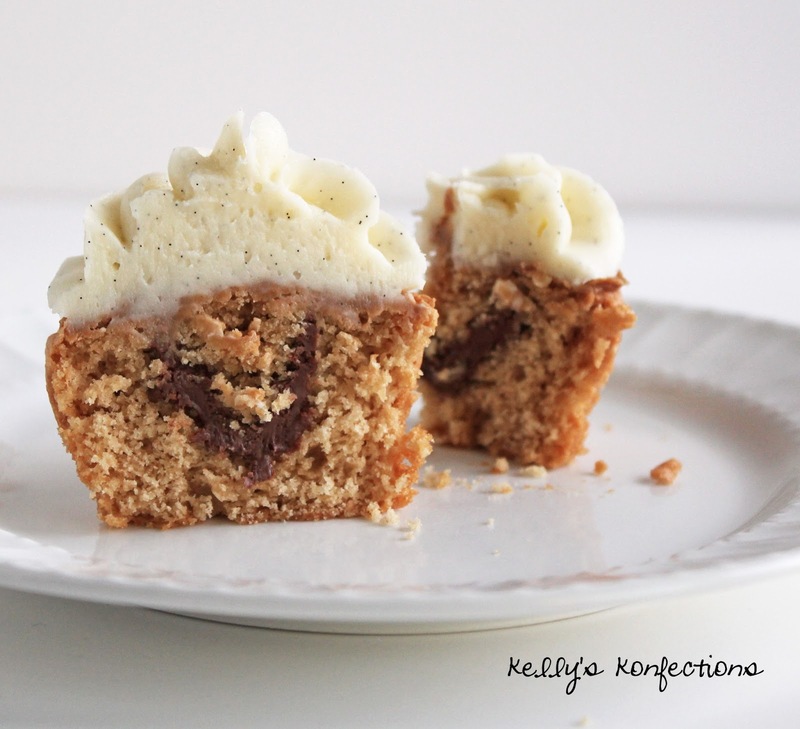 Place butter and cookie butter in a large mixing bowl and cream. 2. Add sugar and eggs and beat until fluffy. Add vanilla and mix to combine. 3. Sift flour and baking powder into a medium bowl. Add half to large mixing bowl and beat to combine. Add all the milk and combine, then the second half of the dry ingredients. 4. Fill cupcake tins 1/2 full and bake at 350 degrees F for 15-20 minutes- keep a close eye on them, the minis took about 15 minutes, but the regulars took closer to 20. It really depends on your oven, so be careful! 5. Cool completely. Cut out the centers (save the tops!) and fill with nutella. Put tops back on, and spread ~1/4 - 1/2 tsp (doesn't have to be exact) of cookie butter on top before adding frosting. 1. Beat marshmallow fluff and butter in the bowl of an electric mixer (paddle attached). 2. Add vanilla bean scrapings and beat until combined. 3. Add powdered sugar and beat until combined. Add milk if needed (depending on desired consistency). 4. Switch to whisk attachment and beat for 1 minute. These things are the real deal. I'm still trying to figure out how exactly they exist.